Mountain View Home in NE Grants Pass. This lovely Home on a Cul De Sac was built in 2007 on a .19 Acre Lot. 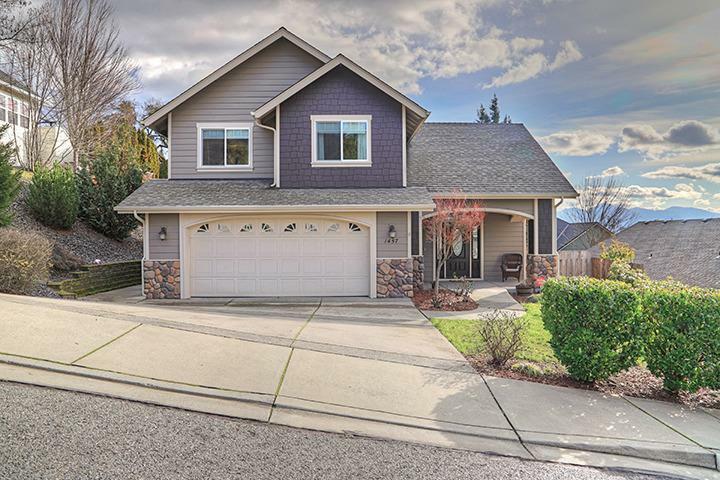 It has Beautiful Mountain Views, 1702 Sq Ft and includes 3 Bedrooms, and 2 1/2 Baths. Enter into the home thru the Beautiful Front Door & Covered Porch. The first floor features a Large Great Room with Vaulted Ceilings opening to a Dining Room, Spacious Kitchen and a 1/2 Bath. The Kitchen features a Walk-in Pantry, Slide Out Cabinet Drawers, Granite Counters, a Large Island, and Plenty of Counter Space for cooking & entertaining. A door off of the Dining Room takes you to a Covered Patio (includes removable framing for screens) over-looking the Large Backyard that includes an Above Ground Pool with Deck as well as a Grass Area with Full Sprinkler System & Raised Bed Garden area. The second floor features a Large Master Suite with Vaulted Ceilings, 2 Good Sized Bedrooms, a Full Bath, and an Upstairs Laundry Room. This Home also has a 2 Car Garage with Lots of Storage & Workbench. Directions: Ne Beacon Dr to Ne Jennifer Way to address on the right, watch for sign.